Plywood and OSB (oriented strand board) panels for specialized applications like furniture, RV or crate/box manufacturing can be manufactured in a variety of thicknesses and sizes. While common sizes are 48-inch widths and 96-inch lengths with thicknesses of 1/4 inch to 3/4 inch, both plywood and OSB can be manufactured in wider, longer and thicker sizes. 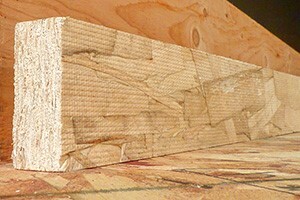 Both OSB and plywood panels can, and are, provided in thicknesses greater than 3/4 inch by many manufacturers. Common thicker panels include thicknesses of 7/8 inch, 1 inch and 1-1/8 inch. Some plywood manufacturers can press 60-inch widths and length up to 144 inches. And plywood panels can use "scarf" joint technology, as a secondary manufacturing process, to join panels together to make both longer and wider panels. Oriented Strand Board panels are manufactured in mats ranging in sizes up to 8x24 feet, but even larger sizes can be manufactured at some facilities. Common thicker panels are 7/8 inch and 1-1/8 inch. Other custom thicknesses may be available. Some primary and many secondary manufactures provide additional cutting and shaping services. Plywood panels with A-grade and B-grade veneer faces are always sanded smooth in manufacture to fulfill the requirements of their intended end use – applications such as cabinets, shelving, furniture, built-ins, etc. Still other panels – APA UNDERLAYMENT, APA RATED STURD-I-FLOOR, APA C-D PLUGGED and APA C-C PLUGGED – require only touch-sanding to make the panel thickness more uniform. Sanded panels are fully sanded to a smooth surface while touch-sanded panels are sanded but not necessarily as uniformly as the sanded panels. It should be noted that when presented with moisture in the form of humidity, vapor or liquid, the grain of the wood may raise and the surface area could become more uneven. APA Sheathing-grade panels are not manufactured with smoothness or appearance in mind. Unsanded panels are suitable for most industrial applications. Common veneer grades used in APA Rated Sheathing are C or D, or a combination of the two. For a full description of veneer grades, consult Panel Design Specification, Form D510. Panels for industrial applications can be manufactured in a variety of ways – as plywood (cross-laminated wood veneer), as composites (veneer faces bonded to wood strand cores), or as OSB. A bond durability classification of Exposure 1 is appropriate for most industrial uses including pallets, crates, shelving or other products. If the application will require permanent exposure to high moisture environments or weather, an Exterior panel, such as APA A-C or C-C Exterior grade should be used. Plywood is manufactured from more than 70 species of wood. These species are divided on the basis of strength and stiffness into five groups under Voluntary Product Standard, PS 1-09, Structural Plywood, Form L870. Strongest species are in Group 1; the least strong in Group 5 (see Table 1 in PS 1-09). 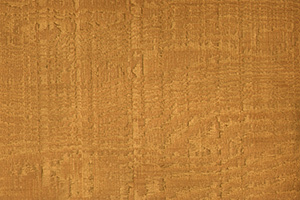 The group number that appears in the trademark on some APA trademarked panels – primarily sanded grades – is based on the species used for face and back veneers. Where face and back veneers are not from the same species group, the higher group number is used, except for sanded panels 3/8-inch thick or less and decorative panels of any thickness. These are identified by face species because they are chosen primarily for appearance and used in applications where structural strength is not critical. Sanded panels greater than 3/8-inch thick are identified by face species if C- or D-grade backs are at least 1/8-inch thick and are no more than one species group number higher than the face veneer group number. Some species are used widely in panel manufacture; others rarely. Check local availability if a particular species is desired. The Span Ratings in the trademarks on APA RATED STURD-I-FLOOR​ appear as a single number. APA RATED STURD-I-FLOOR​ panels have a puncture resistant face. The Span Ratings of 16, 20, 24, 32 and 48 inches are assigned to APA RATED STURD-I-FLOOR​. The larger the span rating number, the stronger the panel. Sanded panels other than fully sanded APA RATED STURD-I-FLOORR panels do not have span ratings. APA Rated Sheathing panels carry numbers in their trademarks called Span Ratings. The Span Rating appears as two numbers separated by a slash, such as 32/16, 48/24, etc. The larger the span rating numbers, the stronger and stiffer the panel, regardless of thickness. The strength axis, or original long panel dimension (unless the strength axis is otherwise identified), should run across the supporting members for greatest strength. The load-span tables are based on this orientation. Designate thickness, APA trademark, grade, group number, bond durability classification, additional information (such as tongue and groove, Sanded Face Structural I, edge treatments), dimensions and number of pieces. 7-ply , 5-layer with parallel center plies 54"x116", 24,500 pcs. These panels are especially designed for engineered applications such as structural components where design properties including tension, compression, shear, cross-panel flexural properties and nail holding and bearing are of significant importance. 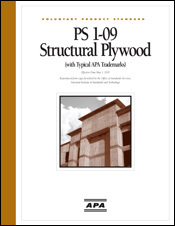 Please see section 5.6.5 Structural Panels in Voluntary Product Standard PS 1-09 Structural Plywood, Form L870, for details on veneer species and grade and bond durability requirements. B-B concrete form panels are manufactured in two classes: Class I and Structural I. Panels are sanded on both sides and treated with a release agent unless otherwise specified. Class I panels will have faces of Group 1 species, crossbands of either Group 1 or 2, and center plies of any of Group 1 through 4. Structural I B-B Plyform panels are also sanded and have Group 1 veneers throughout. Research proves that a square edge on a panel deck performs as well as a bull-nosed edge and slightly better than a chamfered edge when edges are exposed to some types of impacts. 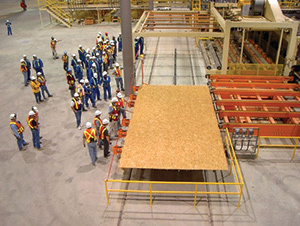 APA members have the capability of manufacturing wood structural panels in many unique ways ranging from using different types of wood species to special textures on the surface of the panels. Plywood and OSB panels are comprised of varying types of veneers or strands and wood species and different thicknesses of layers within the panels. Such variance can provide the end user with panels that have specific dimensional stabilities, fastener holding capabilities, puncture resistance, strength and stiffness, etc. Examples of these types of products can be seen in the upholstered furniture, slave pallet and truck trailer industries where proprietary panels have been developed to perform to specific criteria. 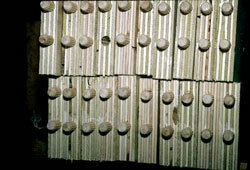 Specific information can be obtained from the manufacturers. Wood structural panels manufacturers can apply different textures to the surfaces of the panels ranging from channel and V-grooves, rough-sawn textures and coatings. These treatments are commonly seen in panels used for exterior siding of residential and commercial buildings and have been used to provide decorative textures on poured in place concrete and retail merchandising displays.